The duo was formed to explore the forgotten traditional and contemporary jazz standards within the framework of the vibraphone and piano. By selecting and arranging tunes for this combination, Geoff Haydon, pianist and Don N. Parker, vibraphonist, create musical textures, which draw the audience into the listening experience. The duo has appeared at several universities and colleges in the Mid-West and the South and has made appearance at the Austin Jazz Festival in September 2001 to end their CD Release Tour of “My Foolish Heart” (ACA Digital JM 10004). The CD has received reviews by the Percussive Arts Society and the Austin Jazz Magazine. 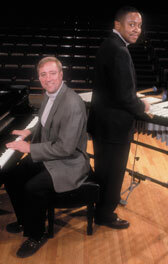 In April 2006 and 2007, the duo appeared as featured artist and adjudicator at the Columbia Basin College Jazz Unlimited Festival in Pasco, Washington with Bill Watrous and Jeff Clayton. In February 2012, the duo presented performances and workshops at the University of Mississippi (Ole Miss), Alabama State University, and Bethune-Cookman University. The duo has presented numerous clinics and performances and, in December 2015, the duo released its 2nd CD entitled “Reunion” ( ACA Digital JM 10005) performing jazz from not-so-standard collection with swing, bebop, Latin, and commercial styles with the addition of acoustic bass.